Today I’m looking at a site that seems to have an Indiana Jones/Lara Croft vibe…. I mean, that’s the first thing that came to mind from the overall theme! The Treasure Trooper website looks like it’s been propelled straight out of the 90’s, which made me feel a bit cautious at first. But is Treasure Trooper legit? Let’s find out! What is Treasure Trooper About? Signing Up With Treasure Trooper. Concluding Thoughts – Is Treasure Trooper Legit? Fed Up Of Making Peanuts? Learn New Skills Here! Treasure Trooper is a get-paid-to site, where you can earn from completing cash offers or paid surveys. With surveys, you will earn a small amount from answering a series of questions, (that’s if you qualify, which you may not much of the time and this depends on your demographic). I noticed that Treasure Trooper have a lot of offers that involve joining other survey panels and completing a survey. You won’t be able to partake in these offers if you’re already a member of the survey panel. Although it looks a bit odd and dated, I actually like the Theme of this site and it makes it a bit different to your usual GPT websites. So many of them are just totally generic and all look the same, so at least this one adds a little bit more fun and quirkiness. Signing up was easy and free… you need to give your name/email/country and home address. Once you’ve chosen your password, they’ll send you an email that you’ll have to confirm before you can join. When you’ve signed in, you can get started right away. They have little animated style pop ups that let you know how things work and what you can do next. There was also an image at the bottom of the screen directing you to either head for paid surveys, or cash offers. Treasure Trooper… Cash Offers, Or Cash Surveys? It’s quite overwhelming when you arrive, as there seems to be a lot of choice – however, I think they do their best at trying to guide you. How Do You Make Money On Treasure Trooper? There are many different ways you can make cash on this platform, but I noticed that some may not be available to you in certain locations. In fact, I found this happening frequently and so, how much you’re able to do is going to be somewhat dependent on location. Paid surveys are one of the main ways you can make money on platforms like this. There are two main sections you can enter – “Study Storm,” where 1000 studies are available at any one time and, “Survey Seeker,” their private survey panel, where there could be dozens of surveys at any time. From what I could see, surveys were anything from 10 cents to around $1.50 in Study Storm – but these will vary. In Survey Seeker, there were only two surveys available and said they’d been selected due to my demographic – they were worth $4 each, but I didn’t qualify! Each time I returned, a new survey would pop up. But every time I’d click, it would bring me back and say I didn’t qualify. Seems I had more luck in Study Storm! Looking For Paid Surveys? Try These Out! So, you can get a lot more for completing cash offers – but be cautious with any where you need to hand over your credit card and check the T&Cs. Many of these offers will charge you after a trial period, if you don’t cancel. But you can also only cancel after a set time to be able to redeem your reward. The risk free cash offers are for signing up to things like, other survey panels. The downside is, these offers are limited because, there are only so many survey panel offers. Here you can link up with lots of other companies for surveys and offers. These are all common names that you’ll find on every GPT site – such as Peanut Labs, Offer Toro, Revenue Wall, Tap Research and many others. Here you can use the Treasure Trooper search engine and you can gain FREE arrowheads. Find the answer below in the “Treasure Trooper Rewards,” section! This section has some cashback options – where you can earn a percentage back for shopping via certain websites. What is available to you here, will again be dependent on location. You can make 20% of anything your referrals earn, plus an additional 5% of anything THEIR referrals earn. So, if your sibling signs up via your referral link to this site, you’ll earn 20% of everything they earn. Plus, if your sibling then refers their friend to sign up, you will earn 5% of everything the friend earns also. But that’s only the beginning, there are extra levels you can enter, depending on how many active referrals you have. The problem is the “active referral,” part. As a huge majority of anyone that joins this site, via you or otherwise, don’t generally remain active for long. Discover: 7 other referral programs here. I can’t comment here – because there were no videos available! However, in general, GPT sites all pay next to nothing to watch videos. I purposefully went to a survey that said it would take under 10 minutes – it was only worth 10 cents! But when I went into the survey, it said it would take 20 minutes! In actual fact, it must have taken closer to half an hour. I got through it, which was good, but it was only for 10 cents and took three times longer than anticipated. This seems to be a common thing – a survey will say it only takes 5-10 minutes, but you go into it and are told it takes 20+ minutes. This isn’t just an issue with Treasure Trooper… I see it all the time, but it’s very annoying. Treasure Trooper Rewards – What Is Going On? One thing I initially found both fun and puzzling in similar measure, were the amount of different rewards available. What did they mean, what are they for and how could they benefit me? While I still haven’t totally got my head around this, I’m guessing that it will get easier to understand in time. One fun aspect I enjoy is that you can exchange various rewards and currencies into others. All the regular things such as surveys and offers will pay in cash, but you can also earn some additional rewards, as explained below. 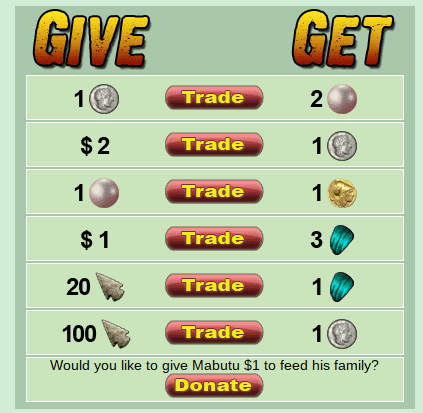 These are coins you can exchange for various items in Mabutu’s trading hut. You can earn Gold coins whenever you complete an offer which pays in cash. These can be earned within the search feature or dig site. They can be exchanged for platinum coins or Dragon scales. You can use these to purchase additional items, for your Dragons and Dragons Lair. Confused? Well, this almost deserves an entire post dedicated to it! Essentially, you can create your own mini dragon world, by purchasing eggs with Dragon Scales and hatching out Dragons. You can then either breed your Dragons, OR there is an opportunity to sell your Dragons back for cash. Apparently one rare dragon is even worth $100…. So, perhaps it’s worth having a go! You can earn Dragon Scales…. Adding to discussions within their chat room. These can be earned via some daily deals and cash offers. You can use these to exchange for gift cards. Pearls are another virtual currency that can be exchanged – you could convert Pearls into gold coins, but there are other ways too. For example, you can save up your pearls to buy a pearl necklace and this means you’ll get the two next unreferred members as your referrals. These are the main ones going on, but there is a lot more info to digest! You can find out more via their FAQ page, but it’s something you can gradually learn as you go along. While it may seem confusing – the important thing is, you’re still given your cash rewards as cash anyway. All the other stuff is really just additional ways you can benefit and it makes things a bit more fun/interesting than other GPT sites I’ve seen. Something else I like about this site, is they do have a forum and a chatroom, where you can chat to other members and get advice. Not all sections are that active, but I did see some new posts from just yesterday, so there are people still active on the forum. I saw via looking at their FB page, that they have been active within the last month. They also have a fun game you can play called – “Jungle Slots.” Each pull costs one gold coin and you only get one pull a day. You can potentially win lots of different awards, including all the ones I just talked about… Platinum and gold coins, arrowheads, pearls and more. This site has mixed feedback online, but overall fairly positive. It has 4 stars on Trustpilot, (but only a few reviews). Also, it’s not always possible to judge on online reviews, as often people are hired to leave good ones around the net. However, some of the good ones also highlighted things that I like about this site personally – like the unique features and the plain fact that it’s much more fun than a lot of GPT websites. Treasure Trooper PROS VS CONS! Extra fun ways to earn. Plenty of ways to earn. Can be confusing – lots of different rewards and things to collect. Minimum $20 cash-out if choosing cash option. Possibly easy to waste a lot of time here and not actually make much money at all. Some surveys will say they take a certain amount of time & that changes when you enter the survey. It is legit, but whether it’s worth it to you really depends on a lot of stuff. If you’re looking to make significant money online… and by that, I mean at least a couple of hundred dollars a month and up to a full time income, then nope… this is not a good way to get to that level at all! But if you’re looking for a bit of fun and to make a small amount of money, then I personally think this website is a lot of fun. I enjoyed it and that’s why I’ve decided to include it within my positive reviews today. There is no harm in just trying it out, it’s totally free to check it out. Beyond Offers And Paid Surveys…. As I mentioned, if you want to make at least an OK part-time income, or full time income then GPT sites and Surveys won’t get you far. If you’d like to learn how to earn more online, this is where I personally got started. There are also another 40+ ways to make money online here. Have you had any experience with Treasure Trooper? Let me know in the comments below!